evoluzination: The real question is: To regulate sooner or later? The real question is: To regulate sooner or later? From the individual to the collective, we all learn the hard way: by tough lessons involving some degree of suffering. There are probably many lessons to be learned from the now dissolved real estate bubble. One that came to my mind recently is that debt should be treated as a health hazard. 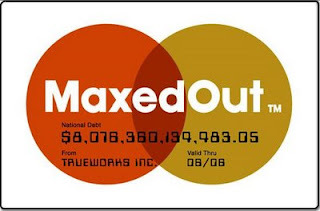 Last year I watched "Maxed Out", a documentary movie that shows very clearly how the financing industry grew its roots by advertising this concept of buying without money. Only then it occurred to me that this "get in debt" concept that comes so naturally to me (although my south american culture is not so much about that, especially when compared with the american one), had to be "sold" to the public originally. I suspect I'm being controversial here (for a change), but, the way I see it, financial institutions should be taxed and regulated instead of being bailed out. I won't get on the bail out thing much, it's a lost battle and I admit I might not know what I'm saying here ... my only comment is, I would have invested and propped the next bubble (most likely energy) instead of trying to save the anyway sinking boat. On the taxing thing, I believe the financial industry should be treated pretty much as the tobacco industry. People should be teached how to use credit wisely, warnings should be issued, recovery should be supported by the same industry that created the problem and beneffited from it in the first place. Education! That's all I'm saying. I'm not saying credit is bad. But credit without education is a hazard for everybody as we can see. The question is not "To regulate or not to regulate?" the real question is "To regulater sooner or later?" and later did us no good.